They come by the thousands — wielding empty carts and suitcases. Over 50,000 Venezuelans cross the Simón Bolívar Bridge into Colombia on a daily basis to pick up much needed supplies including diapers, medicine and toilet paper. The families are hungry and desperate to feed their children. On Thursday, much-needed aid arrived at the Colombian-Venezuelan border, provided and facilitated by the United States Agency for International Development. Several truckloads of humanitarian aid, including food, medical supplies and hygiene kits, were shuttled into Cucutá. Colombian police were on hand to help store the supplies in a warehouse, just across a bridge from Venezuela. 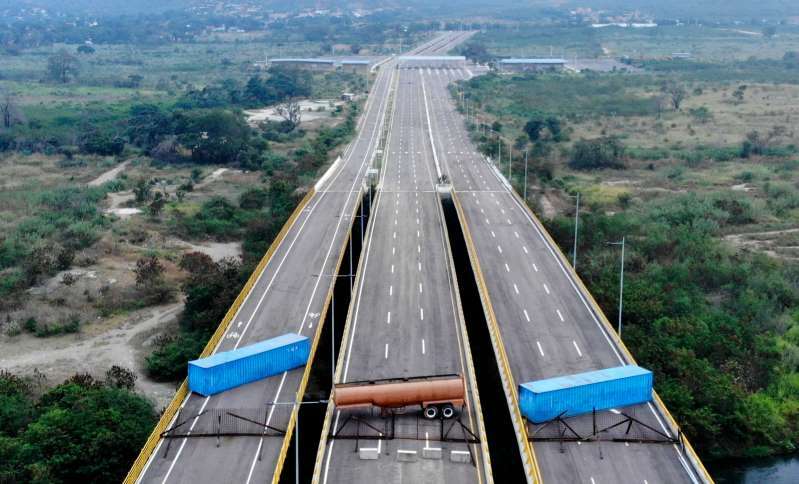 On Wednesday, Venezuelan authorities blocked the bridge with metal barricades and freight containers, keeping any vehicle from moving forward into the country. But opposition leader Juan Guaidó, who declared himself the country’s interim president two weeks ago and has the backing of the U.S. and many in the international community, has vowed to fight to get the supplies into the country. In Cucutá, at a nearby church-run soup kitchen, employees frantically chopped up squash and tomatoes to prepare lunch. The director said the kitchen serves 5,000 for lunch daily. Meanwhile, 3,000 Venezuelans were finishing breakfast. They were served a roll of bread and a cup of milk. At one table, husband and wife Samuel Montana and Yackgilberlie Mendez held their 7-month-old daughter, slowly feeding her milk. Mendez says she had to leave her other daughter in Venezuela, “I don’t know if she’s eating,” she said in tears. The young parents said they were sleeping at a nearby hotel for the time being, but know that their money will soon run out. At that point, they will be forced out on the streets. Some families said they were sleeping at a nearby open football field, on the ground. There are now about 1 million Venezuelans in Colombia, fleeing the spiraling crisis and the shortages of food and medicine. At the soup kitchen, families said Venezuela needs supplies, and urged the U.S. and other countries to intervene to make it happen. On Thursday, a group of 14 European and Latin American nations called on Venezuela to hold free and transparent elections to achieve a peaceful resolution to the crisis. A majority of the 14 countries in the International Contact Group urged Venezuela to return to the rule of law and respect its constitutional institutions — starting with the democratically elected National Assembly. Spain, Italy and Portugal were among the European nations signing the declaration with Uruguay, Ecuador and Costa Rica. Mexico and Bolivia participated but didn’t sign. EU foreign policy chief Federica Mogherini said that the coalition does not intend to impose a solution but is focused on finding answers to avoid violence or foreign intervention in Venezuela.